The RNA World, Third Edition, is no longer available. 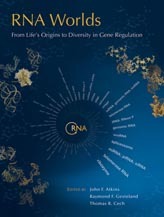 Please click here to go to The RNA Worlds: From Life�s Origins to Diversity in Gene Regulation, Edited By John F. Atkins,�University of Utah, University College Cork, and Trinity College Dublin;�Raymond F. Gesteland,�University of Utah;� Thomas R. Cech,�Howard Hughes Medical Institute, University of Colorado. The free, online only Chapter, Ribonuclease P: Structure and Catalysis by V. Gopalan and S. Altman, can be viewed here.